But what if you could mold your buds so each one perfectly plugs your ear holes? That's the idea behind Decibullz. 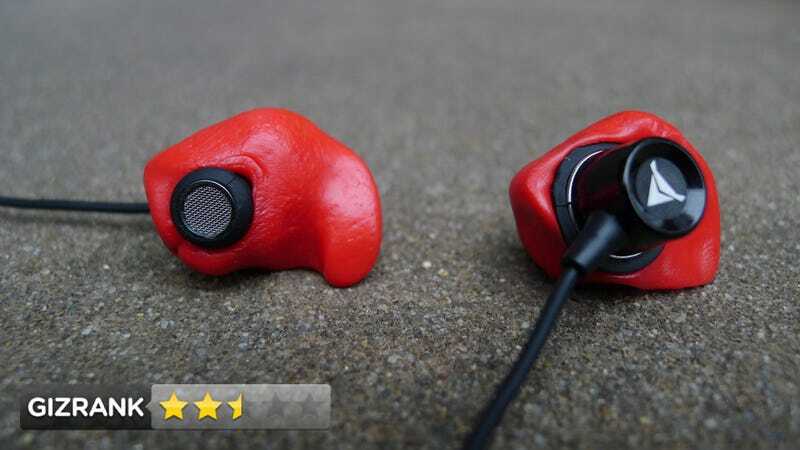 Workout earbuds that mold to fit your ears. People who work out and need their headphones to stay in place. Totally normal—inline controls, a mic, and a standard plug—except for the teardrop-shaped thermoplastic molds you press into your ears. The rock-hard molds don't look comfortable. But then you microwave them for two minutes in a bowl of water, let them soak for three minutes more, and press each into your ears. The warm putty hugs every contour as it cools and hardens over the next five minutes. Sound quality is really lousy and disappointing. The highs are loud, but snares sound like little snaps of static. The mids are very quiet and very muffled. The lows are vaguely muddy, but practically non-existent. The balance is just all out of whack. It's bad. Pushing that warm plastic into your ears and letting it sit there feels, like, a little too good. To make sure the poor sound quality wasn't just the molds' fault, I swapped out them out for some standard rubber tips. The tips improved the bass, but it still sounded really bad. They were a non-starter against my current favorite running headphones, the Sennheiser PMX685i, so I compared them against some earbuds Samsung included with a phone. The free Samsung buds sounded noticeably better. You can remold these as many times as you want. But you cannot leave them in direct sunlight on a hot day. They will melt. I wanted to like them, but no. The audio quality is just too bad. The drivers that Decibullz selected just don't have the power or clarity to cut it. You can do a lot better for the price. This, however, should not stop you from having bespoke buds. See, you can buy the molds by themselves for $10. For the molds to work, you need the kind of buds with replaceable rubber tips. They fit just fine with some Plantronics BackBeat GO Wireless headphones, and they fit my cheap Samsung buds—and the Samsung buds definitely sounded better than the Decibullz afterward.